‘無(무)’라는 한자가 익숙한 사람, 채움에서 비움으로 인생의 시간을 작품 속에 싣는 설치미술가 이성근 작가를 만났다. 그것은 바로 이성근(Lee Sung Kuen) 작가의 작품이다. 이탈리아 또르나부오니 아르떼 전속 작가로 국내보다 해외에 더 많이 알려진 작가. ‘無(무)’라는 한자가 익숙한 사람, 채움에서 비움으로 인생의 시간을 작품 속에 싣는 설치미술가 이성근 작가를 만났다. Feeling cozy while looking at. Big but not big, small but not small. Space surrounds me and I embrace the space, not bothering the natural flows. 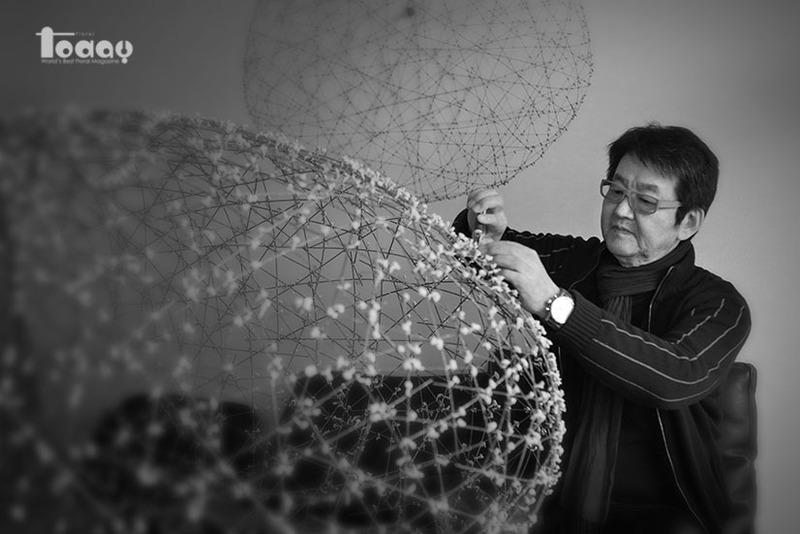 This is the works of artist Lee Sung Kuen. 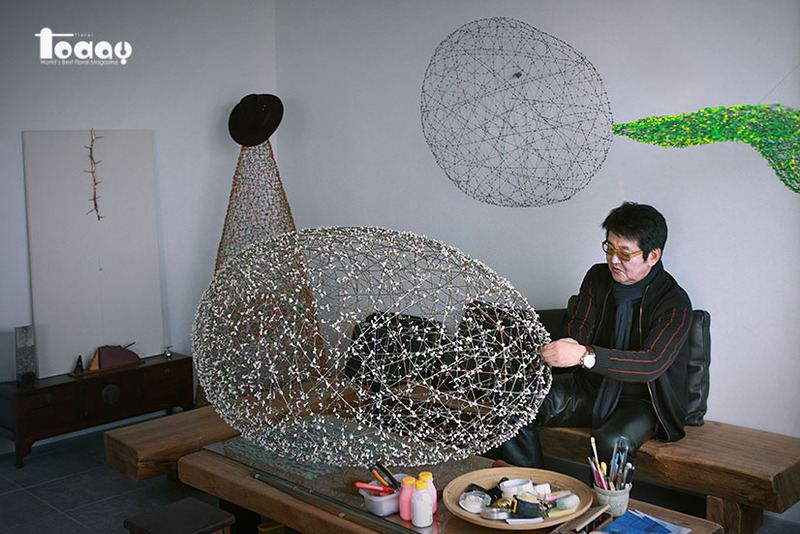 He is the exclusive artist of Tornabuoni Arte in Italy and known more overseas than in Korea. I had a chance to meet this installation artist who is used to Chinese character ‘無(none)’ and conveying the time of life to the artworks through filling to emptying. ▶ 금속공예가, 조각가, 교수 등 소개되는 이름이 많다. 간단히 소개를 부탁한다. 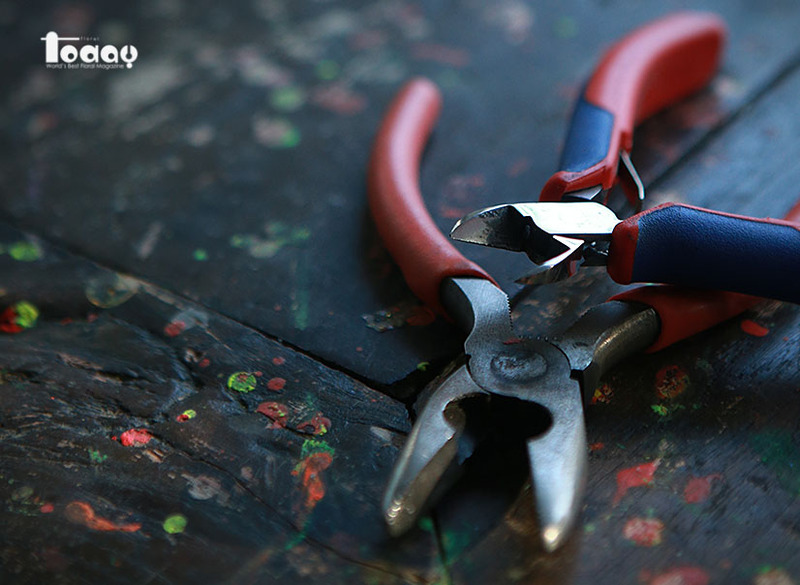 ▶ You have a few Titles such as metal craftsman, sculptor and professor. Please introduce yourself briefly. 나는 금속조형 작품을 통해 공간디자인을 하는 설치미술가다. 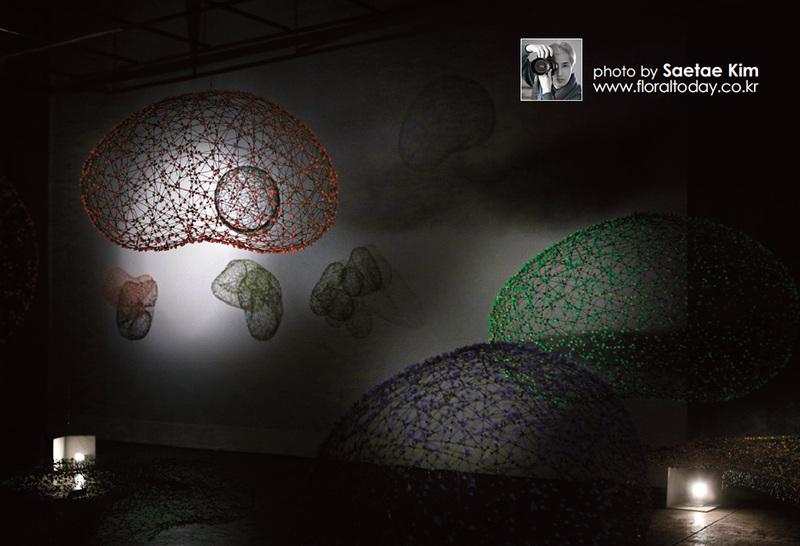 I am an installation artist making space design with metal modeling works. ▶ 작가가 생각하는 금속조형 디자인이란 무엇인가. ▶ What is metal modeling design to you? 금속을 이용한 순수 조형물에서부터 디자인에 이르기까지 전반적인 조형 활동이라 정의할 수 있겠으나, 근본적으로 본인은 예술활동의 범주 안에 붙여진 명칭에 큰 의미를 부여하지는 않는다. It could be defined as overall modeling work ranging from pure sculpture to design using metals; however I basically don’t see much meaning to the names titled in the scopes of art activities. ▶ 어떤 소재들을 사용해 작업을 하는가. ▶ What materials do you use for works? 재료의 물성을 이용한 조형작업을 하는데 주로 특수강선 및 스테인레스 스틸(Stainless steel), 특성 지역의 특산물 같은 혼합재료를 사용한다. I do modeling work using the characters of each material, mostly special steel wire and stainless steel and use mixed materials special locations. ▶ 작품을 멀리서 보면 부드럽고 완만한 형태를 나타내지만, 가까이 들여다보면 뾰족한 가시의 표면이 드러난다. 어떻게 바라봐야 하는가. ▶ The artworks appear gentle and smooth forms in the distance but looking carefully, they show the surface of sharp thorns. So how should look at these? 가는 철사나 나뭇가지, 그것을 연결해주는 매듭에 담고 있는 색채는 강렬하지 않게 빛을 투과 시키고 반투명한 분위기를 만든다. 반투명한 외형을 이루는 형상은 외부 공간과 적응하여 시각적 미감을 보여주는 것이다. 그것은 발광체의 선적(線的) 운동과 같다. 발광체의 움직임에 의해 형성되는 잔상처럼 색채와 형태의 투명성은 주변이나 배경을 자연스럽게 흡수하여 겹쳐진 공간을 만들고 있다. 그것은 배경의 사물들과 작품이 동일화하는 시각효과이다. 그러한 일치성은 작품전체에 흐르는 단일한 구조이다. 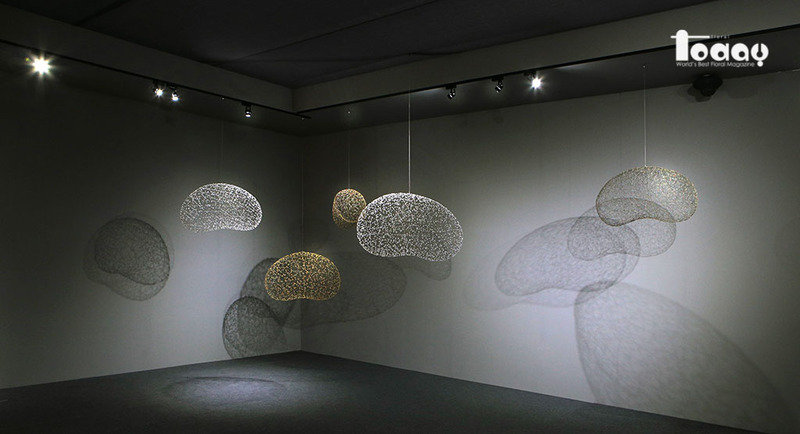 The thin steel wires or branches and the colors holding those connecting knots transmit the lights gently and make a semi-transparent atmosphere. The forms composing the semi-transparent appearance show visual aesthetic sense adapting to outside space. It is the same as linear movement of a luminous body. Like the remaining images composed by the movements of a luminous body, the transparent hues and appearances naturally absorb the vicinities and backgrounds to makes spaces. It is the visional effects that identify the work and the background objects. This conformity is the single structure prevailing on this all the work. ▶ 작가가 표현하는 것은 주로 어떤 것인가. 최근에는 어떤 형상들을 주로 표현하는가. ▶ What do you mainly express? What images have you been working on recently? 대개 부유하는 공기나 액체와의 마찰을 피하기 위해 단순화된 형태를 만든다. 유선형으로 이루어진 작품은 주변의 인위적 환경을 수용하며 스스로 생명력을 찾는다. 그렇게 드러난 형태의 이면에는 빛과 그림자가 항상 따르고 있다. 조명을 받아 색을 보이고 그림자를 만들지만 우리가 쉽게 감지할 수 없는 에너지와 같이 근원적인 힘을 가지고 있다. 그 생명의 힘은 섬유처럼 얽힌 재료들 사이사이 틈을 통과해서 텅 빈 내부로 흘러가고 그 곳에는 ‘인간과 자연의 빛’을 찾으려는 의도를 담고 있다. I mostly make simplified forms to avoid frictions of floating air and liquid. Streamlined shaped works find the life force oneself, taking artificial circumstances around. So the lights and shadows always follow the other sides. 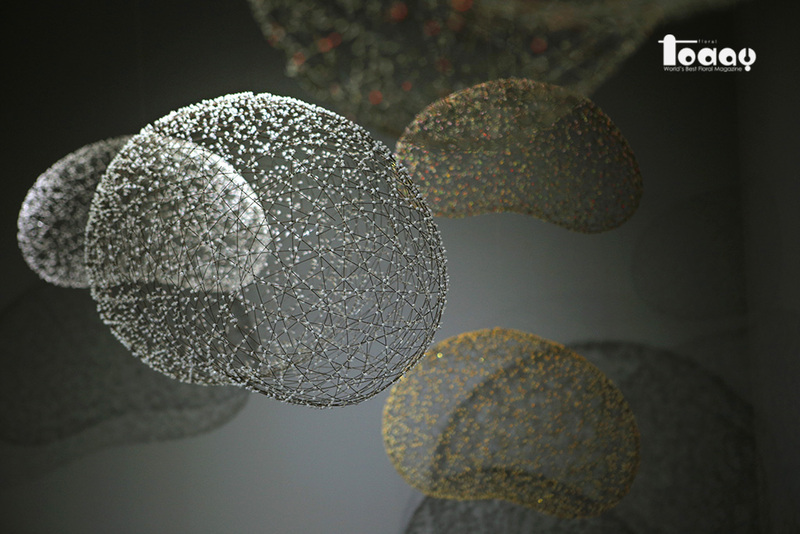 It has underlying power that we can sense like energy, through making shadows and showing the hues with the lighting. ▶ 작품에 대부분 빛이 존재한다. 어떤 의미인가. ▶ It seems that most of work has lights. What does that mean? 생명의 힘이 섬유처럼 얽힌 재료들 사이의 틈을 통과하고 있으며, 텅 빈 내부로 흘러가는 그곳에서 ‘인간과 자연의 빛’을 찾으려는 의도이다. The power of life flows to the empty internals, passing through the crevice of materials interval like entangled filament, and it has the intentions to find out ‘light between men and nature’. ▶ 지난 8회 ‘청주국제공예비엔날레’(이하 청주비엔날레) <운명적 만남 – Mother&Child> 기획전에 참여작가로 전시되었다. 이번 전시는 본인에게 어떤 의미가 있을까. 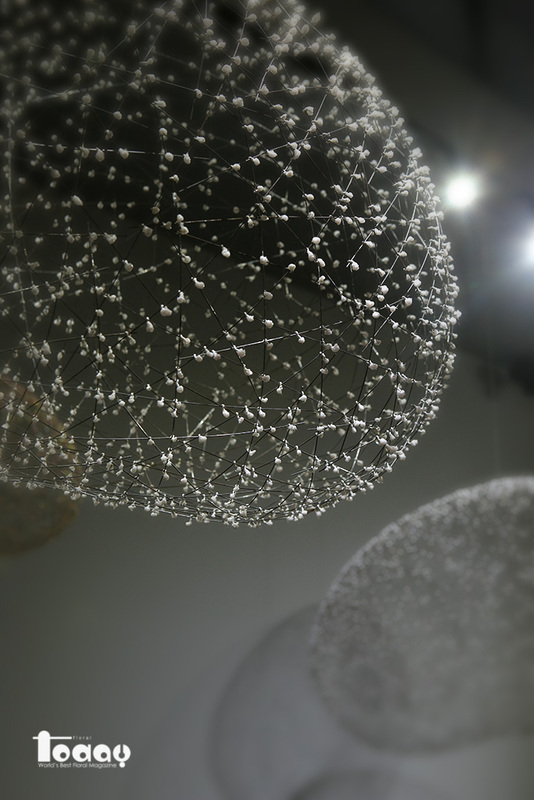 ▶ You joined the previous 8th exhibition, Cheongju International Craft Biennale 2013 (the following Cheongju Biennale) and displayed the works to the special exhibition, <Fateful Meeting - Mother & Child>. What does this new exhibition mean to you? <운명적 만남 – Mother&Child>라는 전시타이틀은 본인 작업 속 영감을 주는 ‘연잎’이 가지는 의미와 상호유기적인 관련성을 갖는다. 어린 시절 어머니와 함께 보았던 연잎의 기억은 오래도록 남아 본인의 작품 세계를 구축하는 근원이 되었다. 실제 삶 속에서 ‘어머니’와 ‘아이’의 공생 관계처럼 본인의 기억을 작업으로 승화해가는 과정 역시 끊임없는 관계와 개입의 여정을 거쳐 지금까지 지속되어 왔다. The title, <Fateful Meeting - Mother & Child> has related to the meaning of which the ‘Lotus leaf’ has and inspired to my work. The memory of lotus leaf that my mother and I share together has stayed for with me for a long time and become the root of building my work. Like a symbiotic relationship between ‘mother’ and ‘child’ in real life, also the processes that sublimate my memory to the work, has stayed until now, passing through the journey of incessant relationship interventions. ▶ 특히 청주비엔날레가 열린 곳은 담배공장이었던 연초제조창으로 전시 장소가 주는 느낌이 신선하다. 그동안 설치 장소와 비교했을 때 작품과 조화가 어땠나. ▶ Especially, the location of ‘Cheongju Biennale’ exhibition held, which used to be an old Tobacco Processing Plant, the factory give refreshing atmospheres. How was the harmony of your work compared to the previously displayed exhibits? 프랑스 파리의 루브르 궁전을 박물관으로, 철도역을 오르세 미술관으로 재창조해낸 것처럼 청주의 연초제조창 건물도 많은 사람들의 정서적 문화 건강을 위한 공간으로 거듭났다는데 큰 의의가 있다. 이번 전시 공간은 기존의 설치 장소와는 다르게, 낡고 오래된 공간이 버려지지 않고 계속해서 재생되어 간다는 관점에서 보았을 때 본인 작업의 주제가 되는 ‘무한한 생명력’과도 그 연관성이 크다고 할 수 있겠다. 공간의 역사성과 공존하는 현대적 조형물들은 시간의 차원을 넘나드는 전시공간의 아우라(aura)를 섬세하고도 매력적으로 표현해주고 있다. Like changing the Louvre Palace in Paris, France to museum and railway station to Orsay Museum, old Tobacco Processing Plant has big meaning to revive spaces for emotional and cultural health of people. This display space unlike previous spaces has a big connection with ‘infinite power of life, which is the theme of this exhibition in the view of not being deserted and reproducing incessantly the old and outmoded space. The modern sculptures that having coexistence over the history of space expresses the aura of the display space crossing different time zones attractively. ▶ 청주비엔날레에서의 원색적인 작품과 달리 지난 12월에 코엑스에서 열린 ‘공예트렌드페어’에서는 무채색의 작품이 전시됐다. 때로는 다양한 색채보다 무채색에서 더욱 많은 메시지를 얻는 것 같다. 작가 개인적으로는 어떠한가. 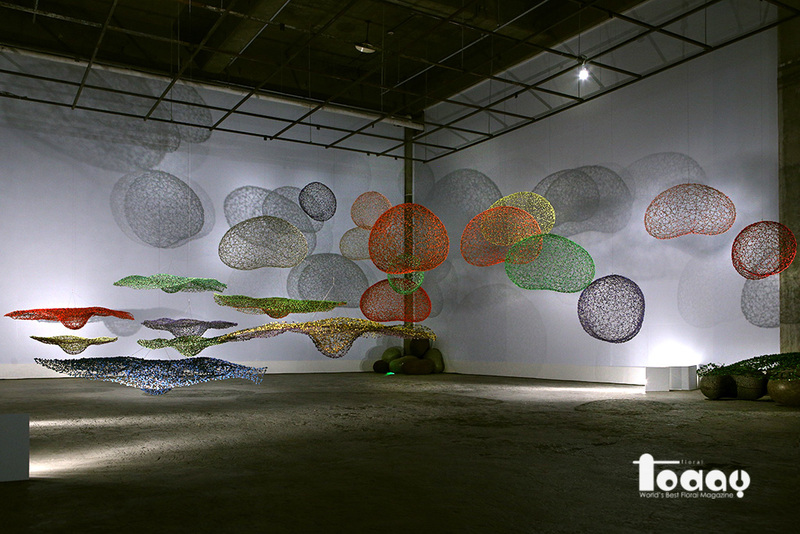 ▶ The achromatic color works unlike the colorful works at Cheongju Biennale had been displayed at ‘Craft Trend Fair 2013’ at Coex in passed Dec. It seems that you get more inspiration from achromatic colors than bright colors. What’s your view about this? 존재하는 모든 사물은 빛이 있는 한 그 외형이 색채로 나타난다. 이러한 색채는 인간의 감정에 직접 호소하며 정서적 반응을 일으킴으로써 가장 직접적인 영향을 미친다. 작가의 내면세계는 색채를 통하여 작품에 표출될 수 있는데, 본인은 그동안 작품 속 색의 표현에 있어서 맑고 강렬한 느낌을 주기 위하여 원색을 주로 사용해왔다. 그에 반해 이번 전시는 ‘소 素 백, 물질을 말하다’라는 주제 하에 만들어진 작품으로, 기존의 원색적인 느낌과는 다르게 무채색을 바탕으로 한 작품들로 구성되어 있다. 백색과 같은 무채색은 ‘없다(無)’는 의미를 지닌 동시에 ‘비워진 그 무엇’이라는 은유적인 의미를 내포하고 있다고 생각한다. 결론적으로 무채색은 무한한 가능성을 담고 있는 조형 공간을 표현하고자 하였던 작가의 의도에서 비롯된 것이라 해석할 수 있다. All the existing objects show the color of outward appearance with the light on. These colors directly appeal to the emotion of human beings and makes emotional reactions that are directly affected. The inner world of artist can be expressed to work with colors, and I have used mainly bright colors when choosing colors of my works to express pure and powerful images. This exhibition unlike usual exhibitions is composed under the theme 'Sobaek' (originality-white) speaking of the materials’ and based on achromatic color base unlike the features of bright colors. The achromatic color like white has the meaning of ‘none’ and involves metaphorical meaning of ‘emptied something’ at the same time. Consequently, achromatic colors can be interpreted as the artist’s intentions to express modeling space involving infinite possibilities. ▶ 작가가 선보이는 작품들은 인공과 자연 요소가 잘 맞닿아 있다. 자연 소재를 활용해 만드는 작품들은 현재 화예작가들의 작업 방식과 닮아있다. 가벼운 터치감이 느껴지는 작가의 작품과 화예작가가 함께 작업한다면 어떤 결과물이 나올까. ▶ Your work has harmony with elements of nature and art. The work utilizing natural elements resembles the working styles of current flower designers. What kinds of outcomes could you have if you did joint work with flower designers? 이번 인터뷰를 계기로 화예디자인에 대한 큰 관심이 생겼으므로 앞으로 발전적으로 생각해보기로 한다. 자연을 소재로 한 자연친화적인 작업이라는 점에서 본인의 작업과 많이 닮아있다고 생각한다. 따라서 많은 관심을 갖고 앞으로 본인 작업과의 융합에 대해 연구해 볼 생각이다. 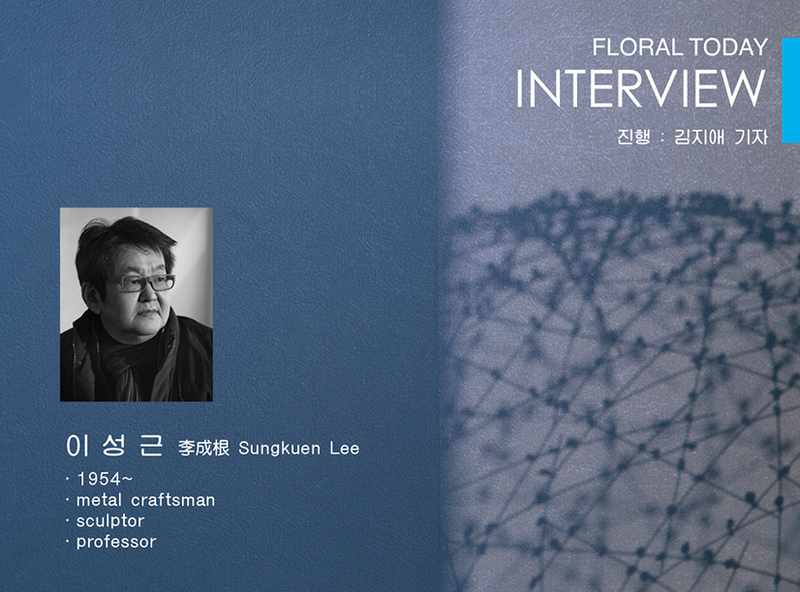 I am more interested in flower designs because of this interview, so I will consider developing this idea from now on. 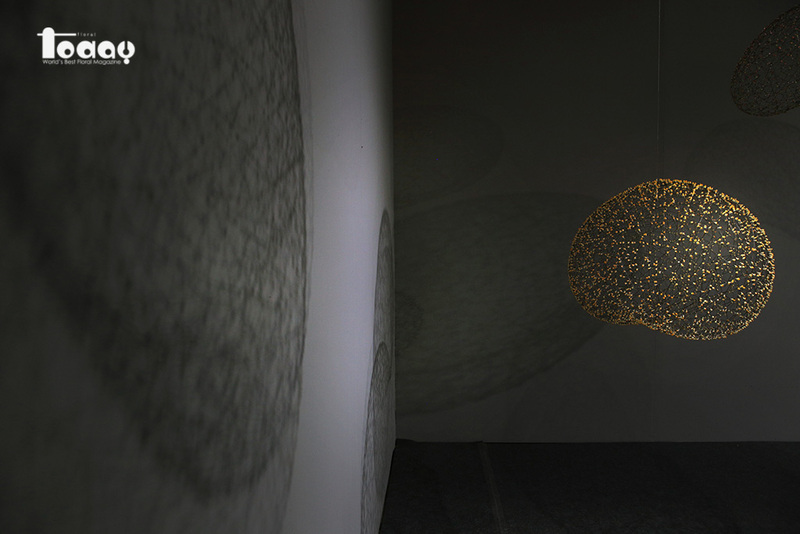 It has similarities in nature friendly designs, which use common natural materials between the two works. Thus, I will consider how to harmonize these two with constant interests. ▶ 앞으로 어떤 작업들을 계획하고 있는가. ▶ What is your work plan to bring on? 재료의 제한적 특성을 넘어서 공간과 공간을 연결함으로써 그 새로운 가치를 만들어 갈 것이다. I will try to make new value through connecting space and space beyond the limited characteristics of materials. ▶ 마지막으로 항상 묻는 질문이 있다. 자신을 식물에 비유한다면 어떤 것일까. ▶ This is the last question that I always ask. Figuratively speaking what kind of plant would you be? 연잎에 비유할 수 있겠다. 가장 자연적이면서 환경 친화적인 특성을 가진 연잎은 빗물을 일정 시간 받아들이다가 어느 순간 쏟아내는 특성이 있다. I would compare to ‘lotus leaf’. The Lotus leaf, which is the most natural, has nature friendly traits like taking raindrops at certain times and pouring them at others.